President Trump's announcement this week that Brett Kavanaugh was his pick for U.S. Supreme Court justice was met immediately with protests from Democrats. Before any of us react, it might be helpful to understand the confirmation process as well as the foundation, the construction and the function of our nation's highest court. Based on our Constitution, our government is made up of three branches: the Executive Branch (president), the Legislative Branch (U.S. House of Representatives and Senate) and the Judicial Branch. The legislative branch levies taxes, passes law, and declares war. The president is the commander in chief, signs bills passed by Congress into law, carries out legislation, pardons felons and sets foreign policy (treaties require Senate advice and consent). The president, also "with the Advice and Consent of the Senate, shall appoint Ambassadors, other public Ministers and Consuls, Judges of the Supreme Court." The judicial branch rules on cases brought before the court. By design, our government is split and cumbersome to make work. But that was intentional. Better to work slowly and have checks and balances than to work quickly and end up with a dictator. You will see some of the slow work of the Senate in the weeks and months to come. The U.S. Supreme Court is made up of nine justices. Once you exclude retiring Justice Anthony Kennedy (who was appointed by President Ronald Reagan), you will see that four of the remaining justices were nominated by Democratic presidents and four were nominated by Republican presidents. The court comprises Chief Justice John Roberts, Clarence Thomas, Ruth Bader Ginsburg, Stephen Breyer, Samuel Alito, Sonia Sotomayor and Elena Kagan. Based on age, Ginsberg and/or Breyer could also be retiring in the next few years. 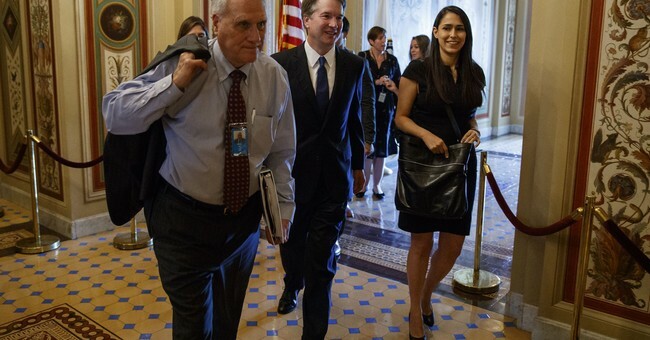 As part of the confirmation process, Kavanaugh will undergo review by the Senate Judiciary Committee, whose members will ask him numerous questions. The committee will vote on whether to recommend his nomination to the Senate. Committee members and staff members will pore over millions of pages of documents related to Kananaugh's career in government. The goal of Republicans is to have the next Supreme Court justice in place before the court's new term begins in October. Sen. Chuck Grassley, R-Iowa, is chairman of the 21-person committee. The ranking minority member is Sen. Dianne Feinstein, D-Calif. Since the hearings will be covered by media, expect that fact to make a difference. In particular, watch for Amy Klobuchar, D-Minn.; Cory Booker, D-N.J.; and Kamala Harris, D-Calif., attempt to throw in questions that they will be able to use later for their own promotional purposes. With the tight split in the Senate (51 Republicans to 49 Democrats), the vote will be close. Sen. John McCain, R-Ariz., is gravely ill and might not be able to return to Washington for a vote. Republicans will attempt to hold onto Republican Senators Susan Collins of Minnesota and Lisa Murkowski of Alaska while trying to sway Democrats up for election in states that voted for Trump in 2016 and who are under pressure to support his choice. These include Senators Bill Nelson of Florida, Joe Donnelly of Indiana, Claire McCaskill of Missouri, Heidi Heitkamp of North Dakota, and Joe Manchin of West Virginia. Those who will be running this fall for re-election will weigh their standing in the polls before voting, and probably before talking. While about a third (35) of the U.S. Senate seats are up for election this fall, 36 of the Democratic seats are safe or not up, and 46 of Republican seats are safe or not up, according to Real Clear Politics. This leaves 13 Democratic seats and five Republican seats likely to stay or in a toss-up at this time. The midterm pressure is on the Democrats. When the Democrats talk about how the Republicans blocked President Obama's nomination of Merrick Garland, they don't acknowledge that it was a different situation. Garland was nominated in the spring of the last year of Obama's second term. Trump has over two full years of his first term left, and may very well win a second term. The comparison is not the same. Keep in mind, as the minority party screams louder, that they are under greater pressure. Much of what will happen will be playing to the cameras and others in the news media -- so please bear that in mind as the drama unfolds.